WASHINGTON, D.C. -- Nonretired Americans are more confident now than a year ago that they will have enough money to live comfortably in retirement. The 54% who currently believe this is up from 48% in April 2016 and is the highest in about a decade. 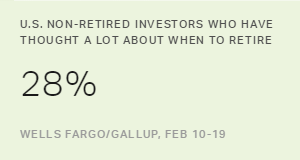 Nonretirees' outlook for retirement is a bit less positive today than when Gallup first asked this question in 2002. That year, 59% thought they would have enough money to live comfortably. It remained high until 2005, when the belief dropped to 53%. By 2008, a few months into the Great Recession, nonretirees' expectations for a comfortable retirement fell to 46% and then continued declining until reaching a low of 38% in 2012. Plummeting property and stock values in the country at this time were no doubt a contributing factor, along with the decline in Americans' economic confidence more generally. Younger nonretirees are much more confident than older nonretirees about retirement. Almost two-thirds of U.S. adults aged 18 to 29 think they will have enough money to live comfortably, compared with about half of those aged 30 to 49 or 50 to 64. Younger nonretirees may assume they have plenty of time to save for retirement, while their older counterparts may recognize that the window of opportunity is closing for them to achieve their financial targets. A separate question asking all Americans -- retired and nonretired -- if they are worried about not having enough money for retirement also shows less concern this year. Fifty-four percent are now "very" or "moderately" worried about this, down from 64% last year. This is the lowest this measure has been since 2004. 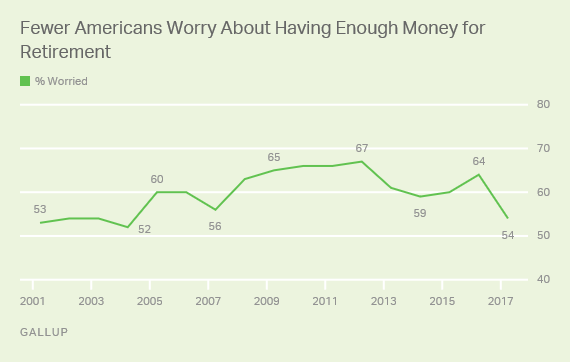 As with nonretirees' confidence about living comfortably in retirement, Americans' worry about not having enough money for retirement was highest during the Great Recession years, with the percentage worried consistently above 60%. 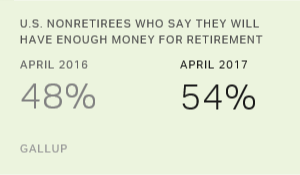 Of those who are retired, 63% are not worried about having enough money for retirement. This could be because once people are retired they become more confident that their financial resources are sufficient. Or, it could be that today's retirees did an effective job of saving for retirement and are now reaping the benefits of that prudence. Those who are not retired have quite different beliefs. Fifty-four percent of Americans who have not yet retired say they are worried about retirement, which could be attributed to concerns raised in the media about Social Security potentially becoming insolvent in the future, along with concerns about the continued viability of the U.S. economy. Americans feel less concerned about their retirement security than they have in some time. 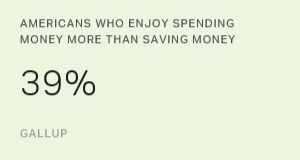 That is evident both in nonretirees' outlook for living comfortably during their retirement and in all Americans' confidence that they will have enough money once they stop working. These trends may be a sign of a somewhat improved economy finally manifesting itself after years of recession and sluggish growth in the labor and housing markets. It may also be a direct function of the continued bull market. According to the Wells Fargo/Gallup Investor and Retirement Optimism Index, investor confidence in the stock market and economy is up sharply from 2016. The trends also may reflect some confidence that the new presidential administration will champion policies that positively affect Americans' personal finances. 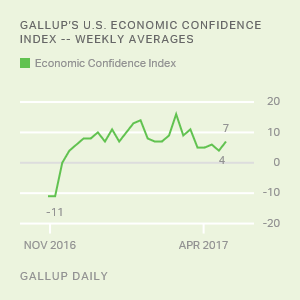 Economic confidence spiked after Donald Trump's election, though it has retreated a bit since then. Still, this may translate to less worry and more confidence regarding retirement finances. Results for this Gallup poll are based on telephone interviews conducted April 5-9, 2017, with a random sample of 1,019 adults, aged 18 and older, living in all 50 U.S. states and the District of Columbia. For results based on the total sample of national adults, the margin of sampling error is ±4 percentage points at the 95% confidence level. For results based on the total sample of 718 nonretirees, the margin of sampling error is ±5 percentage points at the 95% confidence level. All reported margins of sampling error include computed design effects for weighting.